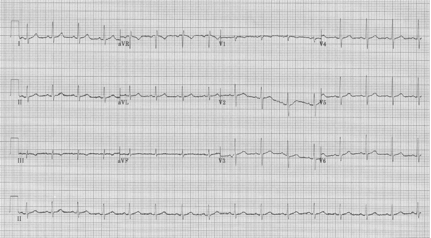 45-year-old man with pleuritic chest pain for 2 hours. The most striking thing about this EKG is the right axis deviation (large Q wave in I) and the generally positive deflection of all complexes in lead aVR (usually P, QRS and T waves are negative in lead aVR). These are clues to switched limb leads. 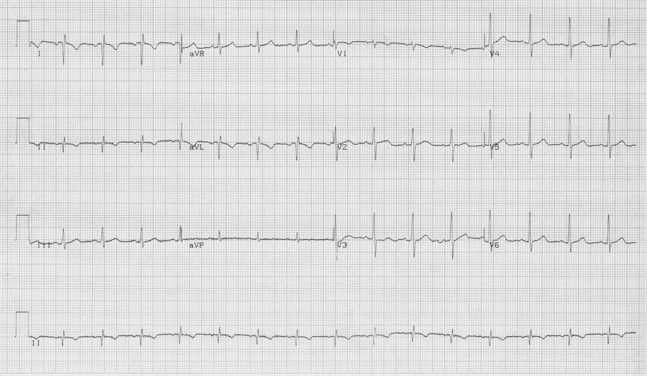 When the leads were carefully replaced, the resulting EKG is a good example of a normal tracing! 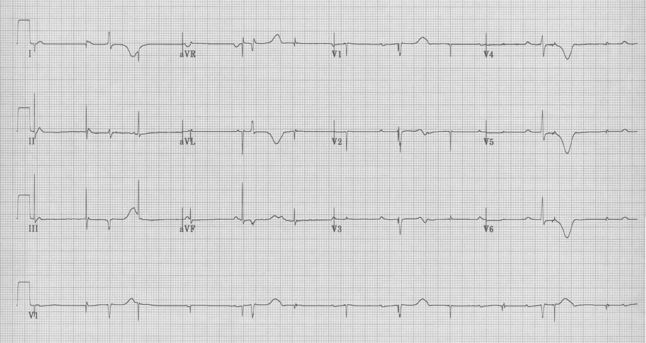 78-year-old woman with several episodes of syncope in church. Look closely at the rhythm strip – there are actually three separate (and unrelated) rhythms on this strip. There are P waves (↑) at 75/minute, QRS complexes (●) at 25/minute that are dissociated from the P waves, and pacer spikes (↓) at 70/minute which neither capture nor sense. This is an example of pacemaker failure and underlying complete heart block (the reason this patient had a pacemaker in the first place). This pacemaker had failed to generate sufficient energy to capture or sense normally – the battery needed to be changed! 64-year-old woman with COPD complains of nausea. 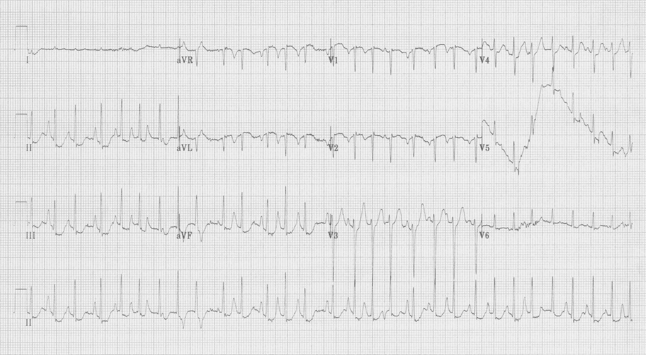 An irregularly irregular tachycardia at 180/minute, this rhythm could be mistaken for atrial fibrillation, but notice the large upright waves between QRS complexes – these are not T waves, but are P waves of varying morphology. They are so large in a lead II rhythm strip because this woman with COPD has R atrial enlargement and these are resulting “P pulmonale”. This rhythm is multifocal atrial tachycardia (MAT). MAT can be caused by several conditions including: electrolyte abnormalities, exacerbation of respiratory disease, drug toxicity (theophylline toxicity), and almost any severe illness – it is said that MAT is one of the common arrhythmias noted in an ICU population. This patient had recently been discharged home after an admission for exacerbation of COPD, but had no respiratory complaints on this presentation. Her theophylline level was 40μg/mL (>2x normal), and a review of her discharge medications found an incorrectly written prescription for twice the usual daily dose of theophylline.